Browse photographs from the public hearings in our photo gallery. Hear the residents of impacted communities in their own words. The Alliance of Carolinians Together Against Coal Ash is a powerful coalition of North Carolinians impacted by Duke Energy’s coal ash. 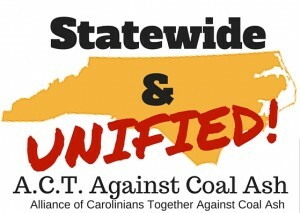 We formed in July 2015 in response to the tragic coal ash situation that plagues our state. We believe that as neighbors of Duke’s coal ash, we best understand the dangers to health, property, and the environment that the toxic waste poses and that we should be consulted during every step of the coal ash cleanup process in North Carolina.